An industry veteran and graduate of the Parsons School of Design and the University of Delaware, Corrie Wilder is an award-winning creative director, who also has worked as an art director for Sports Illustrated and Golf Magazine. Wilder started teaching at the Edward R. Murrow College of Communication in spring 2015. Today as an instructor at the Murrow College in Everett, she shares her professional skills in the marketing, design and communication fields with her undergraduate students in the Consumer Insights and Branding, Quantitative Research Methods, Public Relations Management and Campaigns, and Advertising Principles and Practices courses. In addition, as marketing and communication lead for the Murrow College, she manages public affairs and marketing communication and collaborates strategies for electronic, social media and online communication. 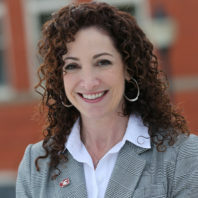 This part of her career, Wilder said, sometimes sneaks into the classroom because she will discuss with her students the promotional work she does for the College. She also has transformed her experiences in the marketing and design industries into activities in the classroom that stimulate and transform creative thinking, she said. One example of this is her use of Basecamp 3. She has used the communication software to build relationships with clients and help creative thinking. She shared this software with her students to manage projects and group communication. Practice with this software, she said, will enable students to gain experience with a program currently used in the industry.